The marijuana industry is booming, and it doesn't show any signs of slowing down in the near future. Legal marijuana is the fastest-growing industry in the United States, according to a new report from researchers at The ArcView Group, a cannabis industry investment and research firm based in Oakland, California. In the next two years, a flurry of states are expected to consider the legalization of recreational marijuana. A majority of Americans continue to support full legalization, nationally, and by 2016, it's entirely possible that marijuana could be a wedge issue in the presidential election. "These are exciting times, and new millionaires and possibly billionaires are about to be made, while simultaneously society will become safer and freer," Troy Dayton, CEO of The ArcView Group and publisher of the third edition of the State of Legal Marijuana Markets, said in the executive summary of the report. "We believe that the development of a responsible, politically engaged, and profitable, legal cannabis industry will hasten the day when not a single adult in the world is punished for this plant." 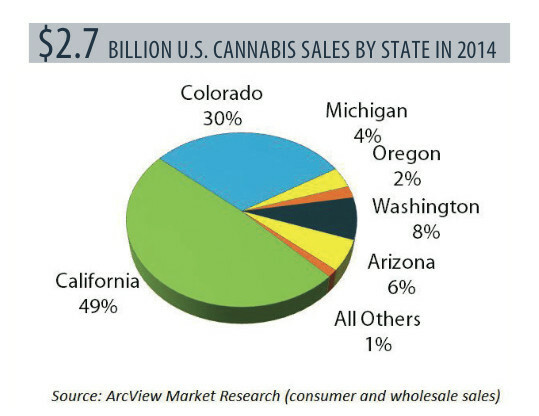 ArcView surveyed hundreds of medical and recreational marijuana retailers in states where sales are legal, as well as ancillary business operators and independent cultivators of the plant. They also compiled data from state agencies, nonprofit organizations and private companies in the marijuana industry for a more complete look at the marketplace. 1. 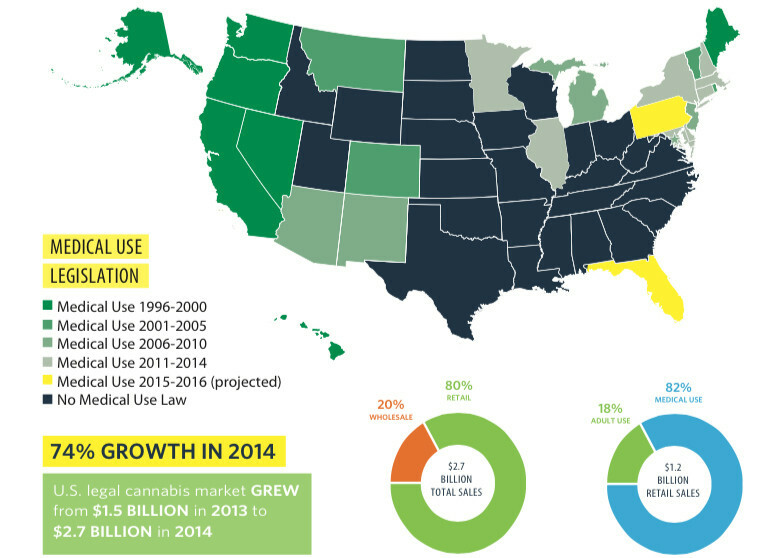 This map shows how many states have legalized recreational marijuana and are likely to legalize by 2020. Graph courtesy of ArcView Market Research. 2. This map shows how many states have legalized medical marijuana and which ones are expected to do so by 2016. 3. This chart shows that California has the largest marijuana market. Right now only medical marijuana is legal, but the state is expected to have a recreational legalization measure in 2016. If voters approve it, the industry could quickly double in size. 4. 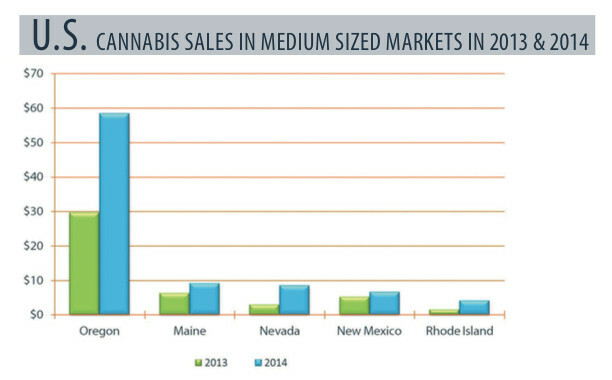 This chart shows the growth states with medium-sized markets have experienced since 2013. In addition, with Oregon, it shows the vast growth that recreational legalization presents a state. 5. 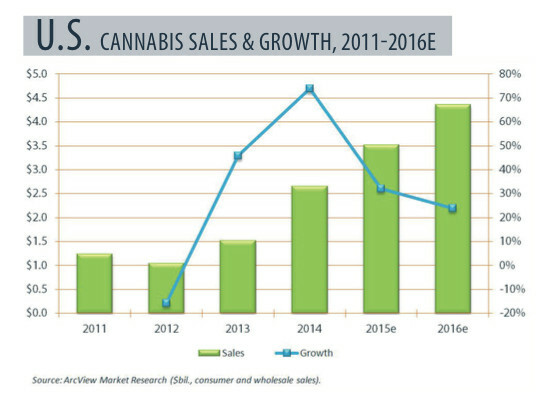 This chart shows the growth in marijuana sales since 2011, as well as the projected increased sales trend into 2016.